Zimbabwe news !!! The latest and breaking news from Zimbabwe !! : Zimbabwe Vice President Mai Mujuru said "she has no faction & if anybody jump or leave behind the usual way of doing things, muZanu PF tinoti kupanduka"
Zimbabwe Vice President Mai Mujuru said "she has no faction & if anybody jump or leave behind the usual way of doing things, muZanu PF tinoti kupanduka"
Vice President Joice Mujuru says she does not belong to any faction in Zanu PF but is part of President Robert Mugabe’s faction. In an exclusive interview with the Daily News on the sidelines of a memorial service for her late husband retired general Solomon Mujuru, the vice president said anyone paddocking her into factions was “misguided” and ignorant of party hierarchy. “In Zanu PF, we have the hierarchy and taking my example, I did not campaign to be the vice president of the party, and I was elected by the people in the party to be the vice president,” she said. 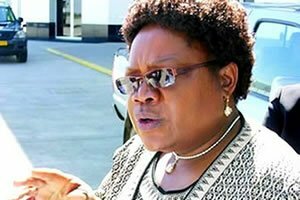 “The hierarchy that exists in there is well-known, if anybody who is not within that hierarchy decided to maybe jump or leave behind the usual way of doing things, muZanu PF tinoti kupanduka, so according to me, Comrade Teurai, I have no faction, my faction is president Mugabe’s faction,” Mujuru said. Mujuru said Mugabe, 89, has been instrumental in shaping her political career from the days of the 70s liberation struggle. “President Mugabe is an honest person, very principled. He does not mince his words when he has a point and personally, I have seen a father, a leader who wants to see somebody who does not forget what he stands for,” Mujuru said. “I have learnt to perfect my approach to things through what I have learnt in president Mugabe. Singling out the land reform, she said this was one example of the “life transforming policies” made by Mugabe during his 33-year-old rule. Mujuru joined Mugabe’s first post-independence Cabinet in 1980 at 25, and was one of the longest serving government ministers before her elevation to the vice presidency in 2004.